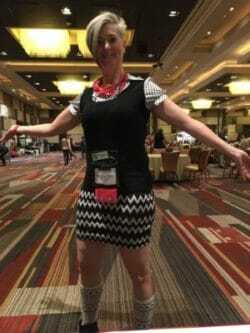 At RESACON Las Vegas earlier this year, I was asked to assist by providing a microphone to audience members that wanted to ask our keynote speaker, the amazing Sabrina Soto, questions. This was great exercise for me in a room of over 400 people eager to ask Sabrina their most pressing questions! I ran from table to table, and logged a bunch of steps on my new Fitbit Blaze. I LOVE to mix patterns and styles, and I do this both with my designs, and my own personal style. While many have often commented that I am fashionable, I would never say that I am trendy – instead I have a tendency to wear what I want, and am frequently told by others that they could never wear what I’m wearing. That’s fine – they don’t have to :). I buy items that are on sale because no one wants them, and mix and match to make something that suits me. So when Sabrina was asked what style/trend she saw on it’s way out (I believe the precise question was “what style/trend do you wish would just die?”), she answered without hesitation – “Chevron”. Of course, I’m standing next to the person who asked the question, and I couldn’t help but look down at my skirt. Those at the tables close to us immediately saw what I saw…my chevron skirt. They began to laugh…as did the tables around them, and the next thing that I knew, the entire audience was laughing! Poor Sabrina hid behind the podium, feeling perhaps a little as though she may have answered just a little too quickly. 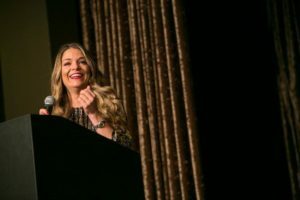 Little did she know that I was laughing along with everyone else, and it’s safe to say that most who attended her talk will remember me long after! After her talk, I had a number of people approach me to apologize on behalf of the crowd, and tell me how bad they felt for me. To be honest, I was stunned! I had no idea what they meant, but soon realized that they were embarrassed for me for being called out on my choice of attire. 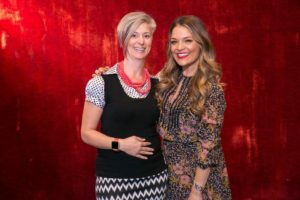 I reassured them that I was no worse for wear , and that I had had a truly awesome day – Sabrina Soto gave me a memorable moment that I will cherish for years to come, along with my chevron skirt (which still gets lots of use). I met up with Sabrina, and thanked her for her candor, and we enjoyed a good laugh. I explained to her that it would take a lot more to hurt my feelings. The moral? Be yourself, and most importantly, don’t forget to laugh at yourself now and again…sometimes we can be our best entertainment!